A U.S. soldier sits on an armored vehicle behind a sand barrier at a newly installed position in Manbij, April 4, 2018. Amid the recent Turkey-U.S. talks to iron out the details of Washington's withdrawal from Syria, America's top military command proposed a watered down process and stressed that the fight against Daesh is not over and the protection of its allies is a priority. "We are going to consider things like protection of our partners, the Kurds. We are going to consider the concerns that Turkey has along their border and we are going to consider how we keep pressure on [Daesh]," U.S. Central Command Chief Joseph Votel (L) said on Tuesday, while commenting on the U.S. withdrawal in a hearing before the Senate Armed Services Committee. Votel's statement indicated that CENTCOM shows no sign of revising its partnership with the PKK-linked People's Protection Units (YPG), which it describes as an "effective" partner in the fight against Daesh. While the U.S. has been obdurately continuing its supports to the YPG, Ankara has stressed that the YPG poses great threats to its national security. In the face of YPG threats along its borders, Turkey has repeatedly asked the U.S. to stop shoring up the group and increase cooperation with Turkey to provide stability in Syria. Trump previously announced that Daesh had been defeated and the 2,000 U.S. troops in Syria will come home in December. He stressed that this decision will be implemented on several occasions. "Great nations do not fight endless wars," Trump said on Tuesday in his annual State of the Union address to Congress, and underlined that the U.S. has taken nearly all of Daesh's territory in Iraq and Syria. "As we work with our allies to destroy the remnants of [Daesh], it is time to give our brave warriors in Syria a warm welcome home," he added. While Trump strongly indicates that he will stick to his campaign promise and enable the withdrawal of U.S. troops, Votel has been pointing that "the fight against Daesh is not over" continuing arguments that contradict the decision to withdraw. "It is important to understand that even though this territory has been reclaimed, the fight against [Daesh] and violent extremists is not over and our mission has not changed," Votel said and also added that he was not consulted by Trump on the decision to withdraw American troops from Syria. In relation to the calendar date of the withdrawal, the top commander said, "I don't consider this to be either time-based or conditions-based. The fact is the president made a decision, and we are going to execute his orders here to withdraw all forces from Syria." Meanwhile, foreign ministers and senior officials from the 79-member, U.S.-led anti-Daesh coalition met in Washington yesterday to carve a path forward with the American forces withdrawal from Syria. U.S. Secretary of State Mike Pompeo opened the meeting with a call for the coalition partners to keep up the fight and ensure the permanent defeat of Daesh. Pompeo said that the troop withdrawal is only a tactical decision and that America will continue its fight in the region. Votel highlighted that the since the president made a decision, CENTCOM will execute the orders. Yet, his comments such as that they will continue to protect their partners the YPG, have left a negative image on the Turkish side, which has been in talks with U.S. officials to work on plans following the U.S. withdrawal. The Turkey-U.S. Joint Working Group held its final meeting in Washington on Tuesday, chaired by Turkey's Deputy Foreign Minister Sedat Önal and U.S. Undersecretary of State for Political Affairs David Hale. According to the joint statement released following the talks on Feb. 6, it was stressed that the sides "reaffirmed the strategic importance of the U.S.-Turkish relationship and committed to addressing shared concerns as allies." It added: "Following a plenary meeting, senior U.S. and Turkish officials met in working group formats to discuss bilateral cooperation on Syria; counterterrorism; defense matters; and judicial and consular issues. The two sides expressed their determination to continue to work together to achieve further progress on all these areas." Ankara has been increasing diplomatic talks with the U.S. with an aim of ensuring that there will be no power vacuum when the U.S. withdraws. Turkey and the U.S. have been discussing the setting up of a safe zone along Turkey's borders with Syria. As previously suggested by Ankara, the safe zone should be under the control of Turkey and free from terrorists. Turkey has made it clear that it will not shy away from taking steps against the presence of the YPG along its borders. In a recent statement President Recep Tayyip Erdoğan said on Tuesday that "Turkey's patience will run out soon if the PKK-linked YPG terrorists do not leave Syria's Manbij in the next few weeks." Manbij town and its surrounding area have been controlled by the U.S.-backed Syrian Democratic Forces (SDF), which is dominated by the YPG terrorist group, since August 2016 after ousting Daesh terrorists who captured the town from the moderate opposition in January 2014. In June, Turkey and the U.S. reached a deal to end YPG presence in Manbij, but Washington has been slow to keep its commitment. Turkey has said it will carry out the necessary operations to oust YPG from the region by itself if the U.S. does not act promptly. Even though Turkey previously put on hold its operation east of the Euphrates River for some time and decided to wait until the U.S.' withdrawal, Ankara maintains its firm position that it will target the terrorist group if its security concerns are not allayed. 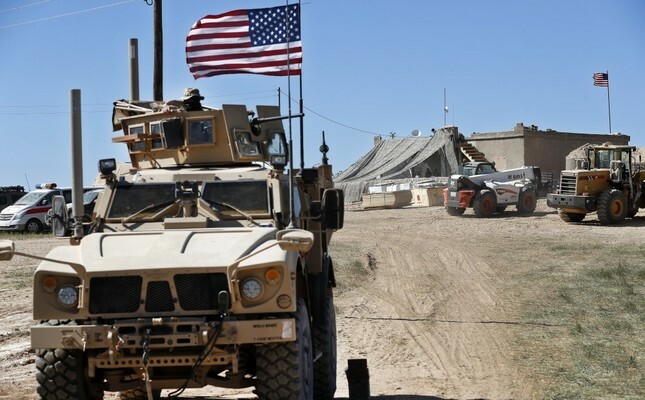 Meanwhile, in the latest move, the U.S. transferring about 150 trucks and armored vehicles and mobile generators to YPG-controlled areas on Monday night Anadolu Agency reported. Accordingly the vehicles arrived at a U.S. military logistics center in Syria's Kharab Ishq and Sirrin on Tuesday.